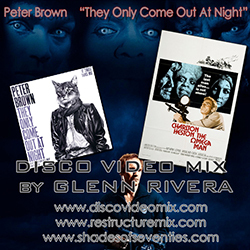 Peter Brown is an extremely talented musician who brought some of the most incredible dance music to disco music from 1977 through the early 80s. Best know are “Do You Wanna Get Funky With Me”, “Dance With Me” and “Crank It Up”. His sound emerged from the Miami sound from disco label Drive Records and founder, Henry Stone. As a surviving disco artist of the late seventies he continued to bring a new sound fitting for changing times. A fully electronic arrangement and pop-synth vibe. “They Only Come Out At Night” is from his 1984 album, “Snap” which became a frequently played track appropriately for the clubs and nightlife scene. I have taken “They Only Come Out At Night” and paired it with the 1971 science fiction film “The Omega Man” starring Charlton Heston and Rosalind Cash. The story follows one of the last surviving humans following biological warfare and his attempts to survive in a lonely metropolis as nocturnal mutants hunt him for death. The theme works with the disco in a more haunting sense. Featuring scenes from “The Omega Man” – RENT THE DVD!